Take all your Marathon purchases–not just the gasoline, but the cigarettes, coffee, and ice cream as well–and divide that by the average price of a gallon of gas to come up with your calculated gasoline purchase amount. You then multiply that by the appropriate rebate amount, which is determined by the tiers we discussed above. Let’s do a simple example. If you spent $1,000 on cigarettes, coffee, and ice cream with your card, and the average price of a gallon of gas is $3.50, your calculated gas purchase is a little under 286 gallons of gas. A $0.25 per gallon rebate on that amount works out to be $71.43, just a bit over 7%. I’m writing about this card for two reasons. The first is that I decided to get this card after I wrote about it, and it does indeed work as I described. I got it when there was a promotion for 50 cents per gallon instead of 25 cents, meaning the rewards were actually 13-14% assuming you spent enough to get into the highest tier. I know that there are some folks out there who like to buy gift cards with a credit card to get points, and all I can say about that is that in my area, they’re pretty good about enforcing that policy. Your mileage may vary. The second reason is that gas prices are falling. And because of the way in which rewards are calculated for this card, that means the rewards actually will increase. You can look here to see the gas price used in Marathon’s calculations, but in September the average price per gallon had fallen to $3.48 per gallon, and it will certainly be lower in October. An average price of $3.00 per gallon would equate to 8.3% rewards, while an average price of $2.50 per gallon means rewards go to 10%. So hopefully the Saudis will keep sticking it to the Russians (or whatever the heck is going on over there). I have a few big issue with your analysis. Gas stations often have worse prices than grocery stores. Going out of your way to purchase items at the gas station to reach a spending tier may actually cost you money if you spend more on those items than you would have elsewhere. On top of this, who knows if Marathon even offers the best gas prices. If you’re spending a few extra cents per gallon by going out of your way to go to Marathon then you are getting less savings. Lets not even mention that gas station coffee is often disgusting sludge and that cigarette will kill you eventually. Finally, the rebate is paid in a Marathon gift card, which reduces the value of the deal even more when you take into account the value of the points lost by using the gift card to buy stuff instead of using a credit card. All in all I would hardly call this a deal for anyone except Marathon. You’re analysis was sorely lacking. 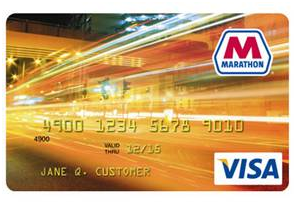 Considering that I just received a letter from Comenity Bank saying that they are DISCONTINUING THE MARATHON VISA CARD. I wonder why you weren’t aware of that fact??? This blog post is several years old and I quit updating the blog several months ago, dumbass.